HaydnW92 wrote: and I've been told by several of my car-enthusiast friends that these cars have fantastic acceleration. I can't wait to find out. I heard the same; just be careful in the wet as it has a tendency to lurch from understeer into snap oversteer with very little warning. For the technical questions on the Cloverleaf/Q4 I have to pass and hope that other members can help! All I have to do now is find one...which is easier said than done. Part no. 60567726. I also need to work out what I'm going to choose in terms of brakes. I plan to replace the front and rear discs and pads, and all the flexible hoses. Does anyone have any recommendations? I know 164 brakes aren't a strong point, so with my car being modified I figure it's best to upgrade if possible. I don't plan to drive everywhere like Lewis Hamilton but it'll be good to know I can rely on my brakes. Aside from that, my new clutch master cylinder should be arriving soon so hopefully I can fit that this week, which should signal the end of my clutch troubles. It would seem you are correct Alfan - I had a quick look yesterday evening, but I didn't find any. If I have to buy a used one then so be it, but new would be better. Regarding braking I am actually quite happy with my Q4. I can't remember if the disc size is different, but the rear ones are vented. Of course, with the extra power in your Q4, it might be something to look in to. I appreciate the feedback Alfan - I believe the front discs are the same as on the QV, but the rears are vented as you say. I could happily settle for standard replacement parts as I know I won't be driving at full throttle everywhere I go, but given I'm going to replace it all anyway it seems like a good opportunity to upgrade. Wheareas this is roughly how it would look (minus the wheels - though I do like those too). 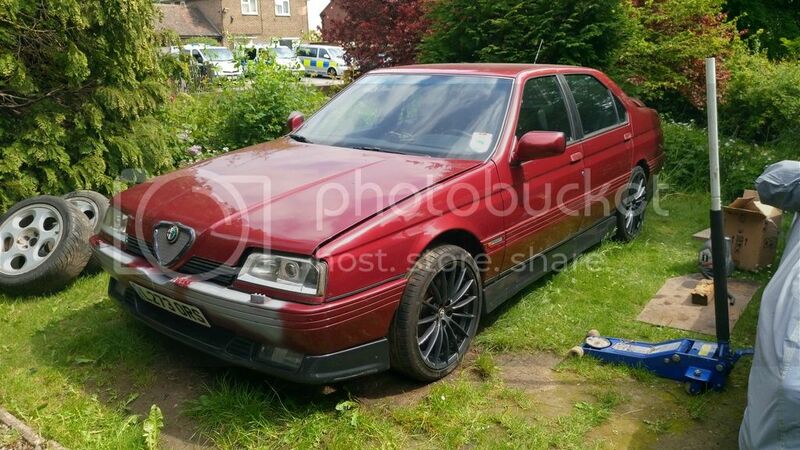 In fact if I'm not mistaken I think this car belongs to somebody on this site, Alfa 164 Superwebmaster perhaps? HaydnW92 wrote: Whereas this is roughly how it would look (minus the wheels - though I do like those too). 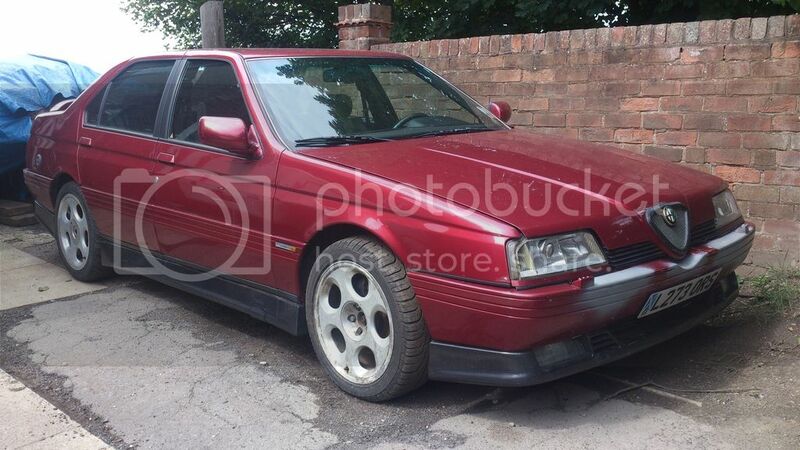 In fact if I'm not mistaken I think this car belongs to somebody on this site, Alfa 164 Superwebmaster perhaps? Yes, this is a row of Dutch 164's, so hopefully some of them can comment as well. I don't know if it is more sensitive to stone chips? Hmmm maybe you're right Alfan, and I don't mind keeping it original. I do like the coloured bumpers and skirts though. Stone chips would probably be an issue I hadn't thought of! I'm wondering whether the combination of Proteo Red, black Recaros and Tan door cards is nice or a bit sickly haha. Mine is all black inside, but I actually think the contrast could be quite nice. It doesn't require that much to change later, if you get tired of it. Btw. the black Zender spoiler from my spare Q4 is available for you, if you are still interested. I can take some more photos of it, the next time I go to the garage. True. For the sake of ease, I think I'll leave it for now. I've also had another go at finding the part of the thermostat housing that I need...it looks like I'll have to buy a used one! I have two pieces of good news to share. The first; my new clutch master cylinder arrived so I fitted it a week ago. This is not a job I wish to repeat; I was so uncomfortable, and for much of it I had to use the force to guide me as I certainly couldn't see what I was doing. I had to remove the very heavy driver's seat to give me half-decent access, and also the lower part of the dashboard that swings down to reveal the fusebox...below is a picture of the view I had, for those who haven't had the pleasure of doing this job yet! I noticed something wasn't right as soon as I saw the cylinder. I then bled the clutch on Saturday as the evening arrived, and the pedal feels pretty good now. The only issue is that there's an inch or so of 'travel' in the pedal before you can feel the pressure, but the clutch was bled until no more air bubbles were present so I think it will be fine. For reference, in my father's 24V QV the clutch pedal has no travel at all before you can feel the pressure, but this doesn't really mean anything is wrong with my Q4. I might bleed it again in a few days just to be sure. On Sunday afternoon when I returned from work I tested the pedal again - no change, it still feels good to me. You may remember I previously described how I could bleed the clutch one day and then return to the car the following day to find the system needed bleeding again; this seems to be fixed now. The second piece of good news is that I've finally found the thermostat part I need. After trying three different people/companies in the Uk and getting nowhere I've found a complete assembly in Germany for a fair price. I only need the bottom section but it can't hurt to have spares for the other two. So when it arrives, I'll hopefully have the Q4 running and driving again...next on my list will probably be the brakes. Cool! All the right brands to go with Alfa Romeo. Great that you got the clutch fixed and that the leaking thermostat might also be taken care of! The thermostat assembly has now arrived and it appears to be in good condition - it just needs cleaning up, as you might expect. For future reference if anyone else needs one, I paid 60 euros for the complete assembly including the sensors which I think was a good price. I also placed an order with Bertelsbeck in Germany for the three thermostat gaskets, the two small water hoses and a new thermostat. Meanwhile, the clutch pedal has kept its 'feel' and the fluid level in the reservoir hasn't dropped - I think it's safe to say my clutch problems are over, at least for now! I've also made a small amount of progress with my Cloverleaf. The fuel pump now seems to be working though only when cranking the engine - I thought it was supposed to work with the ignition switched on too (prior to cranking)? However there is still no spark. The distributor cap, rotor arm and crank sensor are fine, I tested the resistance across the coil and it doesn't match what my workshop manual says it should be...so I've ordered a new Bosch coil. Even if this doesn't fix the issue, it eliminates one potential source of the problem. I have some good news... my Q4 is alive once again! I managed to replace the broken part of the thermostat housing with a bit of a struggle, then put everything back together and double-checked everything was fitted correctly. I bought a new battery for it which needed charging up properly and the car had very little fuel in it, so I sorted these issues out this morning and then tried to start it...but it wouldn't fire up. I soon realised that I had removed a couple of fuses at the front of the engine bay, so I replace these and she fired straight up the tappets are a bit noisy on the rear bank and there's an exhaust leak from just before the catalysers, but apart from that she seems to run OK. No visible petrol, oil or coolant leaks. I even recorded a video, as promised. I'm very happy, and very relieved! Yes it's rather noisy isn't it! I'm hoping that a complete oil change will quieten it down a bit As you say, it is slowly getting closer to being back on the road. Anyway, I have also spent money on the Q4 over the last month. This includes new grooved performance brake discs (front), new performance pads (front), Goodridge stainless brake hoses and motul dot 5.1 brake fluid. This morning I ordered rear performance pads (tricky to find for the Q4!) and a pair of drilled and grooved rear vented discs. So these should be arriving in the next couple of weeks. I should add that I wouldn't normally go for drilled discs on a road car as I've heard a few bad things about them, but they were the only 'upgrade' option I could find that weren't overly expensive. I'll take some pictures of all the brake parts when I get round to fitting them. I can share one picture with you guys though. Last week I fitted a spare set of Alfa wheels to the Q4 as the tyres on the Azev wheels (the wheels the car came with) were clearly old and I didn't think they were safe to use. The wheels I fitted are 18" Alfa GT 'Jet Fins' and I'm quite pleased with how they look, even though they're only a temporary set while I finish refurbishing the Zender wheels. Do you live opposite a police station? Or what are those vans lurking in the background? Here's a small piece of information to add to yesterday's post: Jason at Alfissimo contacted me to let me know that he no longer offers drilled and grooved Q4 rear discs, just grooved ones (but he had forgotten to update the listing). He prefers not to drill them now, which I understand completely. I told him that I was happier with grooved discs as opposed to drilled and grooved, so he says he'll get them sorted and ship them as soon as possible. alfa east wrote: Do you live opposite a police station? Or what are those vans lurking in the background? Yes - it's the local police station, just over the road from my house. Good to know for the Q4-owners here! And I guess that that location means that your Alfas are relatively safely parked in that part of town! alfa east wrote: Good to know for the Q4-owners here! Indeed! It's reassuring to know the cars are mostly safe. Not that I live in a bad area, but you know what I mean! Time for a Q4 update, which I'm going to split into sections as there's quite a lot to type. I've made good progress over the last 4/5 days so the list of jobs on my 'to do' list was slowly decreasing. However, I keep finding new problems. -A few other odd jobs. 3) Fabricate a couple of de-cat pipes to join the downpipes and mid section together. Now for the gearbox problem. With the car running, you can engage 1st and reverse without any problems. However the rest of the gears will not engage, unless you push down on the gear lever quite hard when selecting a gear in which case you can just about manage to engage 2nd gear. Moving the gear lever through the gears feels strange - it's difficult to describe, but it feels like the gates for each gear are present, but the gear lever doesn't seem to go into any of the gates 'properly'. For example the gear lever feels like it's too far back if you try to engage 2nd, 4th or 6th. I've removed the leather gear surround and when pulling back the gear knob to engage these gears the lever shaft is almost touching the centre console? If you push it forward to engage 3rd of 5th it feels like it's about to spring straight out of gear. Also, if you put it into 3rd gear and slowly pull the lever back towards the back of the car the gear lever has to travel quite far back before it pops out of the gate for 3rd gear. Can anyone make any sense of this? I'm sorry if it's unclear but it's difficult to describe! I've had a quick look at the linkage and I can't see any obvious problems such as excessive play, so I honestly don't know what to make of this? If anyone can point me in the right direction I will be eternally grateful. To add to my previous post I have created a video which hopefully shows what's happening with my gears.